We’ve all been completely head over heels for someone, and have been left completely heartbroken when we realized that we’re not getting the official title. Not having the title, and not having the extra security blanket can really mess with your head! This situation can be applied to all relationships, any gender, any race, any group––we’ve all had a taste of this sour situation. Never ever, believe that after some time passes you can get someone to change their minds about the life path they are choosing to take. That’s a decision for them to make, and for them to make alone. In other cases, we find ourselves in the sticky situation of unanswered questions. If your fling can never answer the, “what are we?” question, take that as an automatic, “we’re nothing and we never will be, I’m just having fun with you.” If that’s not something you’re interested in, it’s time to pack your suitcase and hit the road. Don’t get me wrong, summer flings, flings with no titles, and sometimes just messing around can be all fun and games. But, if you know within your heart and mind that you want something more, never try to convince yourself that you’re okay with the “no title” path. You’ll only end up getting hurt in the end. The moment that we start compromising our standards, needs, wants and morals, we’ve made a grave mistake. Before Jack or Susan came into the picture, we knew what our ideal relationship looked like. It’s important to ask ourselves, “If I’m not respecting my own standards, why should my partner?” We should always make a special effort to take care of ourselves and our feelings. That means knowing when to walk away, and also knowing when to avoid get involved in the first place. Whether it’s a “situationship”, relationship, or fling, both parties deserve happiness. Some things are worth working through, and sticking it out. Other things, not so much. Especially if those other things come without the title that you wanted from the very beginning. Don’t hang around and waste time in a situation that you can’t see yourself in long term, and you see no room for growth in the direction you’re aiming for. It’s extremely hard to walk away from people that don’t give us what we want, but we want them. Especially if we feel we were led on. However, walking away is much better than letting weeks, months and years go by. Don’t trick yourself into thinking you’re happy and this is what you want, when it isn’t. You want what you want for a reason. Always remember that reason and always stand your ground. The cutie at the coffee shop may be really good at persuading you into something you don’t want, but you’re really good at remembering and knowing what you want and need. Avoid situations that don’t sound appealing to you and situations that don’t line up with your long term goals. Always remember your self worth, and your “why.” Why do you want the things you want? Why do things have to be a certain way for you? Focus on your “why” anytime it seems like you’re getting caught up in something that may not be good for you. Again, casual relationships may be a perfect fit for some of us, but for those of you who would rather not, stand your ground. Lee is 21 years old and lives in The Bahamas with her husband, Miguel and her black lab, Jupiter. 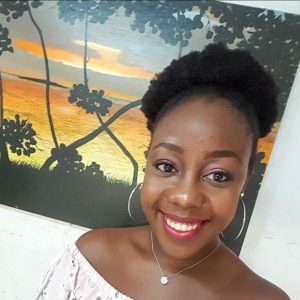 She is a blogger and content writer, writing about relationships and family life. She started writing at a very young age as a hobby, and then decided to make it a career!